The HTC U12 Plus has just been announced. It’s a big, beautiful Android phone that promises to bring a rather hefty price tag. It stands out from the fleet of competing flagship phones with its pearlescent glass look and its noted lack of a notch on its screen. HTC’s latest phone has more competition than usual, especially from an option that delivers many of the same specs for considerably less cash. We’re talking about the OnePlus 6, the sharpest, most feature-packed phone that the young company has made yet. We’ll be drilling into several key categories to see how HTC’s shiny, squeeze-friendly phone stacks up against the OnePlus 6. Most phones win and lose some categories, making the buying decision rely more on taste than much else, but this one could be different. The HTC U12 Plus has taken a page out of 2017 design, but that’s not such a bad thing. Put next to its predecessor, the HTC U11, not much has changed. HTC has maintained its peerless glass design, now available in a few colors: Flame Red, Ceramic Black, Translucent Blue. The former red option offers the same pearlescent effect that we loved in last year’s phone, shimmering in multiple shades of fiery red depending on the angle you hold it. Titanium Black is the most bland of the three, and the new Translucent Blue is the model that HTC will be pushing hard, with its see-through back that exposes some internals. HTC’s U12 Plus may not have the OnePlus signature alert slider, but it definitely makes up for it with its intriguing haptic solution. You’ll find all of the familiar buttons here, but none of them are actually buttons, but are more like the non-moveable home button on the iPhone 8. You’ll feel a buzz each time you push it in, but there’s no pressing. OnePlus 6 may offer gesture support for its screen, but HTC is going all in on its Edge Sense tech this year. The phone can recognize which hand you’re holding it in, and squeeze the screen down to one-handed mode with a tap of the thumb along its side trim. Have you ever gone from using your phone upright to laying down and been annoyed when the screen re-orients to landscape mode? Yes, it’s an incredibly specific issue, but the U12 Plus can recognize when your grip on the phone hasn’t changed and will keep things oriented in portrait mode. OnePlus wins out with its inclusion of a 3.5mm headphone jack. You’ll also find a slick all-glass design here. What will decide it for you is if you want a phone with more screen on the front. Underneath the front glass of both phones, you’ll find some pretty good tech, but there are trade-offs to consider. The OnePlus 6 packs in a 6.3-inch display that’s considerably bigger than the U12 Plus’s 6-inch screen. Besting the OnePlus 6’s 1080p resolution, the U12 Plus opts for QHD. Despite its superior resolution and pixel density, it houses an LCD display versus OnePlus’ OLED display. You’ll always find more vibrant colors and better contrast on an OLED, so long as you’re alright with the OnePlus 6’s notch. Both the OnePlus 6 and HTC U12 Plus come with Android Oreo out of the box and are confirmed to receive the Android P update. However the former is one step ahead of the latter, as it’s already compatible with the Android P beta. That’s a pretty good sign that it’ll come to the OnePlus 6 faster than HTC’s latest phone. When it comes to power, you’re getting a lot with these phones. Each comes with the Snapdragon 845, the latest high-end Qualcomm chipset. For those who enjoy multitasking and running the latest apps and games, you’ll be pleased to find 6GB of RAM no matter which phone you choose. But OnePlus 6 ups the ante with an 8GB of RAM configuration that HTC can’t match. If you’re not a thrill-chaser looking for the most bleeding-edge specs, HTC’s phone will do you right, though the OnePlus 6’s high-end option will likely be the more future-proofed choice. The HTC U11 impressed us with its camera performance last year, and it looks like the U12 Plus may best it. Sporting a dual-lens rear camera system that brings OIS and EIS along for the ride, you’ll get a 12MP wide-angle lens that features HTC’s UltraPixel 4 tech, with an impressive f/1.75 aperture. The other lens is a 16MP telephoto lens that boasts a f/2.6 aperture. As you may know, a lower aperture value means that more light is let in, but what the phone’s processing does with that light makes all the difference in whether the image turns out well or poorly. Compared to the dual lens setup on the OnePlus 6 and it’s easy to see that, on paper, the U12 Plus pales in comparison to its 16 + 20MP package. OnePlus manages an excellent f/1.7 aperture on both lenses and backs it with OIS as well. Around front, the U12 Plus rocks two 8MP lenses for a hardware-based bokeh effect. OnePlus 6 features one 16MP lens, so we expect both lenses to do pretty well. Specs aside, we expect the HTC U12 Plus to fare better when it comes to taking the one-off shot, thanks to its sensor that can capture larger pixels. We’ll have to wait for the final review to know for sure. Moving along to battery, the U12 Plus beats out the OnePlus 6 with its 3,500mAh battery, which is interesting consider that OnePlus’ latest is a bit bigger. You’ll find a bit less there, to the tune of 3,300mAh. It’s honestly not much to get up in arms about, but HTC seems to be leading the charge here. Both phones offer fast charging, each seeming capable of delivering half a day’s charge in 30 minutes. However, you’ll likely be disappointed in both for their lack of wireless charging. A glass back is necessary for wireless charging to work, but neither company is participating in the trendy feature. 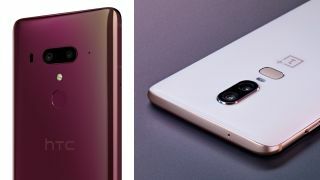 The HTC U12 Plus and OnePlus 6 will each be available in several countries around the world shortly after their respective launches. We expect these both to be easy to find no matter where you are in the months following release. To say that the OnePlus 6 undercuts the U12 Plus is an understatement. Available starting at $529, it’s almost $300 cheaper than the latest HTC smartphone, which debuted today at $799 (£699) for its 64GB model, or $849 for the 128GB variation. You can double the storage of the OnePlus 6 and opt for 8GB of RAM for $50 more, bringing the total to $579 (519 pounds). At that, maxing out the latest OnePlus phone still puts you in at a savings of over $200 compared to the HTC U12 Plus. The OnePlus 6 and the HTC U12 Plus are neck-and-neck for most of the flagship race, with the latter losing its edge because of its high asking price and slightly inferior LCD panel. OnePlus makes compromises to meet its lower price point, like opting for 1080p for its screen and slacking on an IP protection rating (HTC’s phone is IP68), but it’s still a far better deal that will appeal to more people. If HTC can get its price down over time, our feelings may change.